Ben Airth and Sachu Constantine of the Center for Sustainable Energy explain how solar plus storage can strengthen California’s electric grid — and the importance of good government policy in helping it do so. When it comes to solar electric power, California has a good thing going – perhaps too good. Too much clean, affordable, abundant energy? It’s true because high levels of solar production from utility-scale facilities and widely distributed rooftop installations occur during daytime hours when demand may not be at its peak and grid-supplied electricity is plentiful. 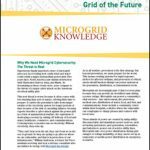 Seasonally, and under certain conditions, this leads to an oversupply of energy on the grid and requires curtailment of generation resources, including wind and solar. We should see this as an opportunity to further reduce fossil fuel generation and to build a more robust, resilient and efficient grid. The challenge is to match our daytime supply of clean renewable power with the actual demand for electricity, which now peaks in the evening. Fortunately, California is poised to turn this challenge into opportunity by putting power into battery storage for use when it’s needed. 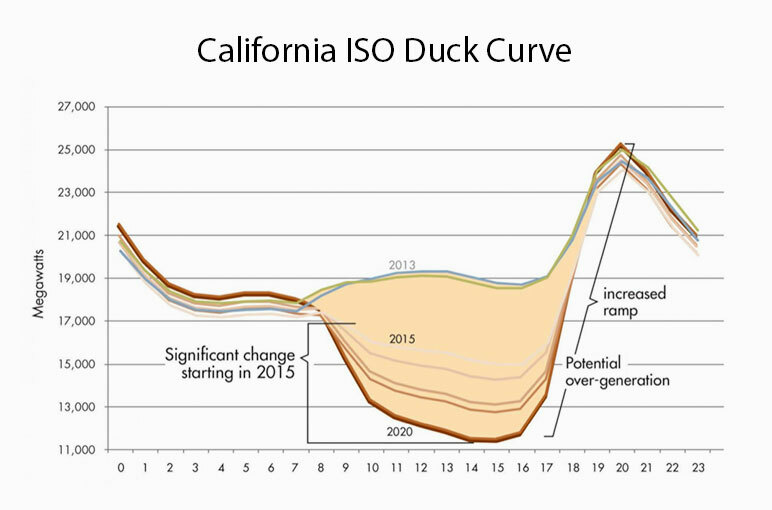 The “belly” of the duck shows the expected impact of solar generation during peak production hours. With increasing solar deployment, the duck’s belly may continue to expand, requiring costly curtailment of either the solar or the baseload resources. What’s more, peak demand increasingly occurs during the early evening hours after the sun has set. This requires CAISO to steeply ramp up generation, the “neck” of the duck, using fossil fuel-fired peaker plants until baseload resources can handle the load. 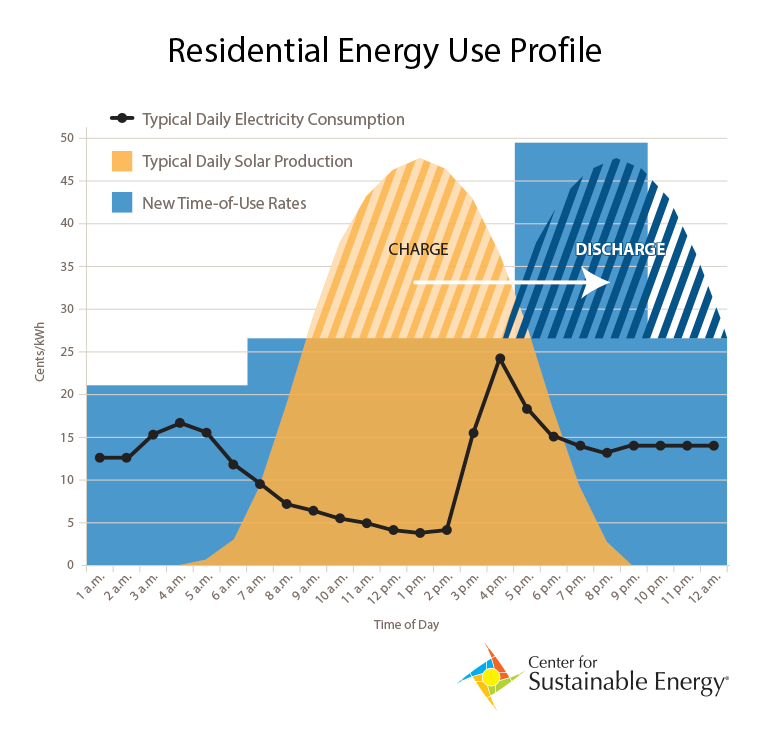 This balancing of energy supply and demand must be continuous to mitigate the risk of both over- and undersupply, and the effect of solar as illustrated by the Duck Curve is a particularly costly and impactful scenario. In response to the Duck Curve, utilities and the California Public Utilities Commission have started to design rates and tariffs to better reflect time-varying pricing, moving away from historic volumetric tier pricing to dynamic, time-of-use (TOU) rates. This means homeowners will pay significantly more for turning on their lights, running their dishwashers and doing laundry when they return home from work in the evenings. To take control of their utility bills, consumers can become more energy efficient and conserve, but they also can invest in self-generation to offset demand for grid power. Solar plus energy storage offers a solid solution to this dilemma. By storing solar energy produced during midday in batteries in their homes and using it later in the day, Californians can reduce dependence on grid-generated power during hours of peak usage and higher rates. When pairing solar with battery storage systems on a wide scale, Californians can not only save money, but also reduce strain on the grid and mitigate the Duck Curve. 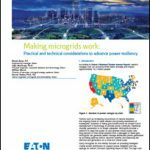 With nearly instantaneous response time, battery storage can smoothly ramp up and regulate supply, displacing peaker plants while simultaneously decreasing intermittency (power that is not continuously available). Energy storage also enhances resiliency, and defers utility transmission and distribution upgrades — all of which will save ratepayers in the long run. The potential social benefits are substantial, including cost savings, expanded consumer choice, a cleaner environment and robust clean-tech market and job growth. California policy has long promoted solar energy, recognizing the threat of climate change and continued greenhouse gas emissions from fossil fuel combustion. Currently, attention is focused on energy storage with Senate Bill 700 (Wiener) working its way through the legislature to create a market transformation program aimed at fostering growth of solar plus energy storage. To maximize the benefits of combined solar plus storage and reduce greenhouse gas emissions, policymakers must continue the path of establishing appropriate price signals grounded in good utility rates and tariffs along with clear and transparent interconnection rules. But they also must deploy properly designed market transformation programs that effectively reach all businesses and residents, particularly low-income customers who pay a higher percentage of their total income toward their energy bills than other population segments. In this time of changing rates and higher utility bills, combining solar and energy storage improves stability for the power grid and will ultimately help Californians take more control of their energy usage and contribute equitably to the state’s clean energy future. An investment in incentivizing energy storage technology, just like California did for solar, will be well worth the effort. Ben Airth is a senior specialist for distributed energy resources and Sachu Constantine is director of policy for the Center for Sustainable Energy. A non-profit, the center is dedicated to developing a clean energy future that addresses climate change, increases energy independence and generates lasting economic and environmental benefits. CARB should be finding out how to help deploy battery storage wherever Edison proposes another gas-fired power plant. People keep saying the technology is 4-5 years out. It doesn’t look like that; it’s a matter of priorities. Very good point here. It sounds simplistic but it is the nature of the law of energy supply and demand. Only benefits can happen here.